I love pizza. I love mushrooms. I love vegan cheese. I love tomato sauce. You too? Well today's recipe is all those things in one super delicious bite. 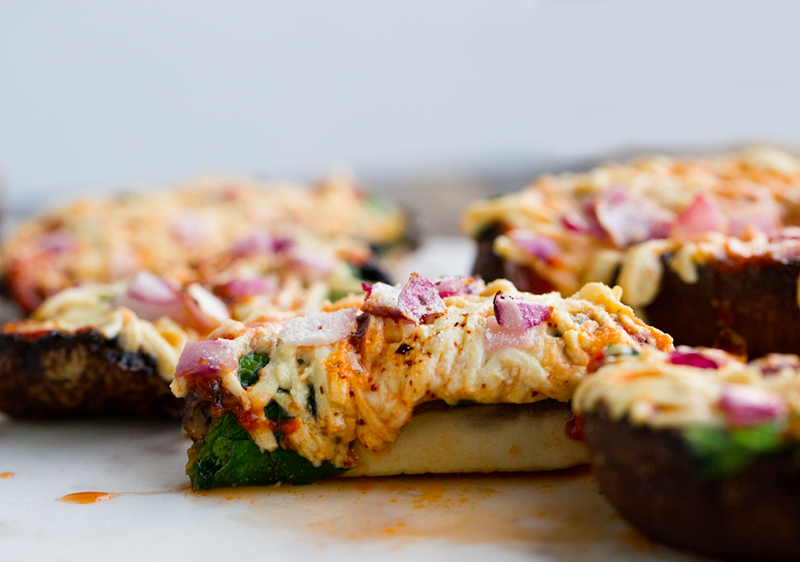 Portobello Mushroom Pizzas are here! Today we have a pizza party! Minus the traditional crust. So if you are into 'grain free' and 'gluten free' recipes, these are for you. 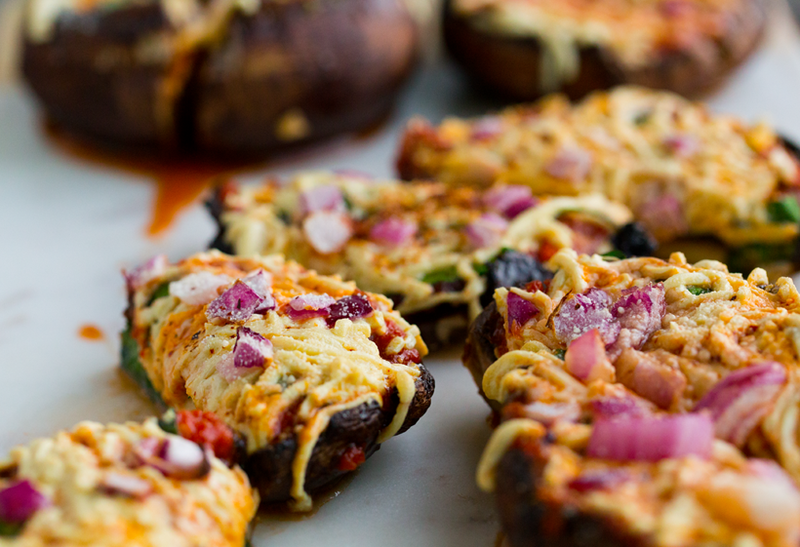 Or if you just lovvvvvve mushrooms and pizza and can't wait to eat pizza mushrooms, *raises hand*, that's great too. These cuties are delicious for just about everyone. Serve them as a snack or eat a giant platter for a meal. 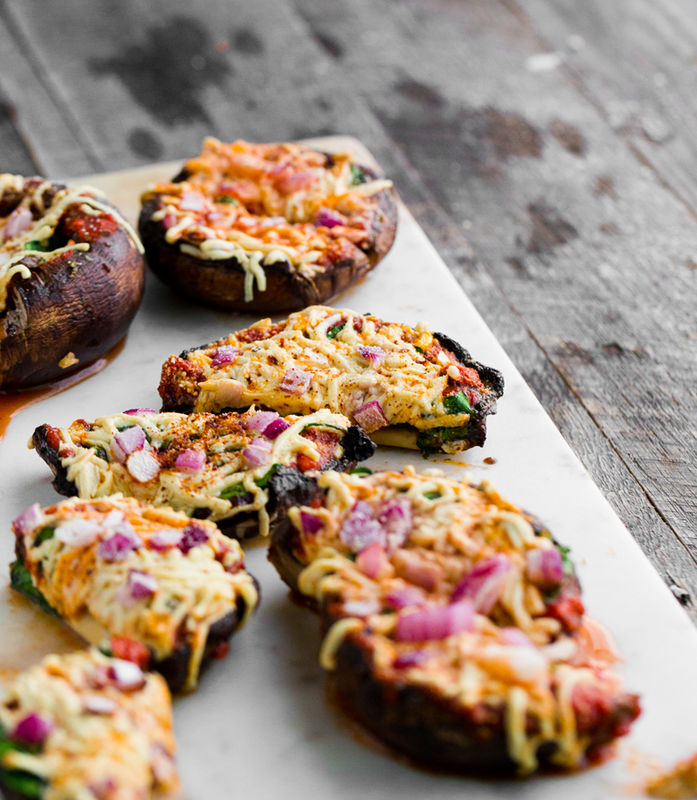 Watch my how-to video and snag my recipe ahead!.. We start with giant mushrooms. 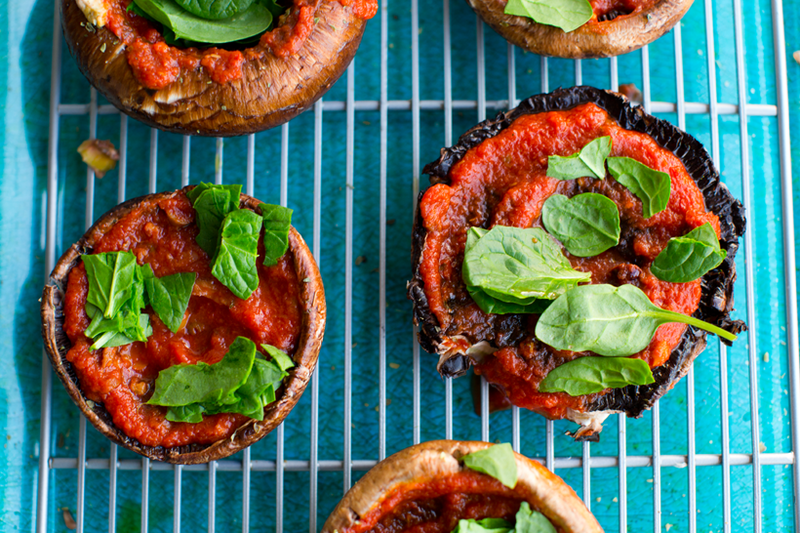 The best portobellos for this recipe are large and wide and flat! Flat like a pancake. 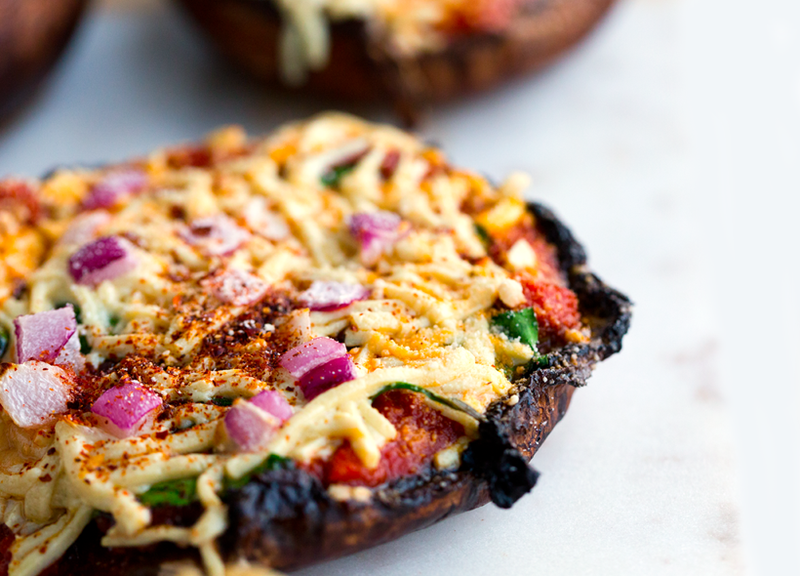 I had a mix of flat and chunky, but the best 'pizzas' came from the floppy, flat shrooms. 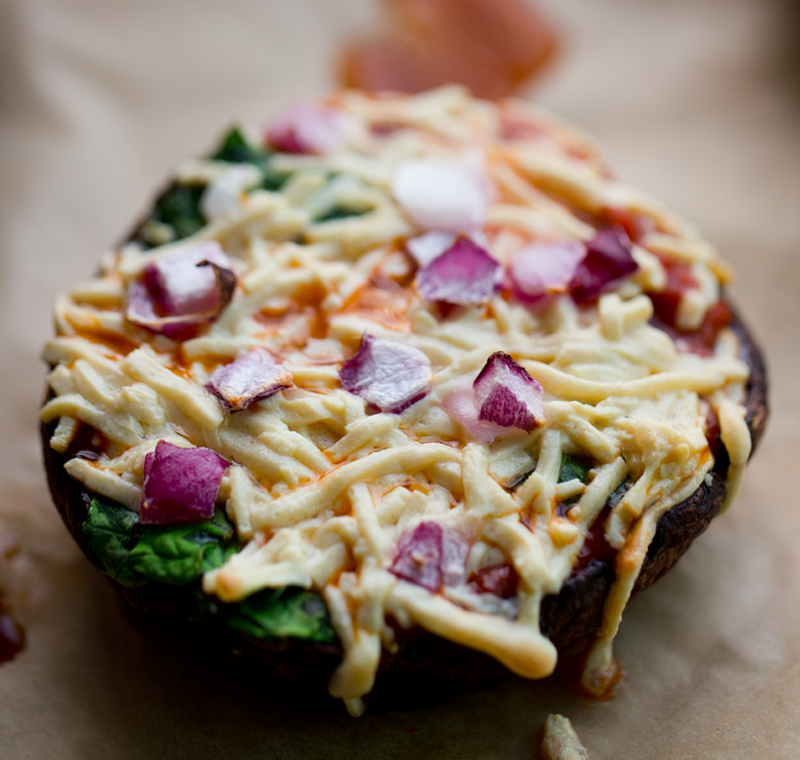 Add greens or other veggies..
Pile on the vegan cheese shreds!.. Bake and serve!.. I served with some vegan parmesan and red chili flakes on top. How to make these a meal? Serve a giant platter of them! Kinda like sushi. I think 2-3 pizzas per person (average sized portobellos) is a good portion. Load on even more toppings if you want a heartier bite. 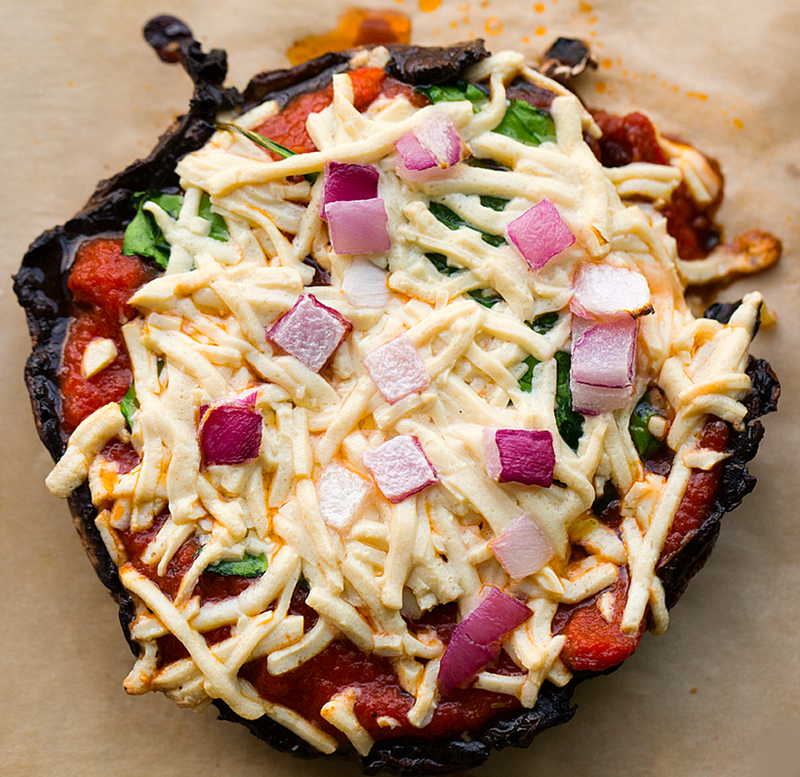 You can also always lighten up the vegan cheese if you want. I clearly got very into the "cheesy" part of these pizzas and loaded on the shreds! The cheese I used was Daiya, but there are a few awesome mozzarella brands like Follow Your Heart and even Miyoko's Kitchen. 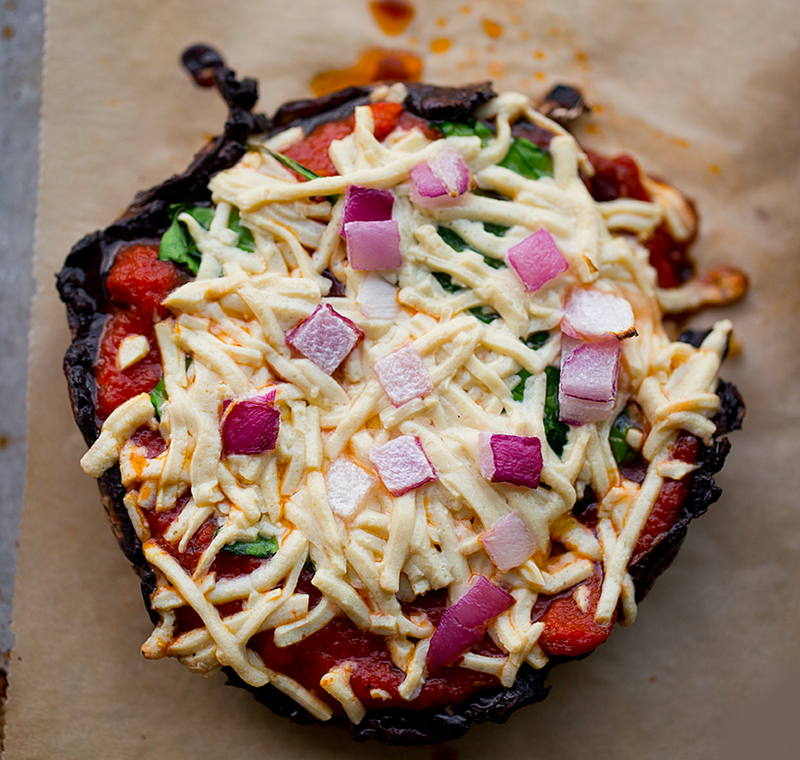 Check out my vegan cheese guide for more cheese brands and tips! Preheat oven to 450 degrees. Prep a baking sheet with oil or parchment paper. Remove the stems of the mushrooms and rinse well. Pat very dry with paper towels. The drier the mushrooms, the more suace and flavors the shrooms will absorb while cooking and the less overly juicy they come out in the end. Place the mushrooms on a prep board. 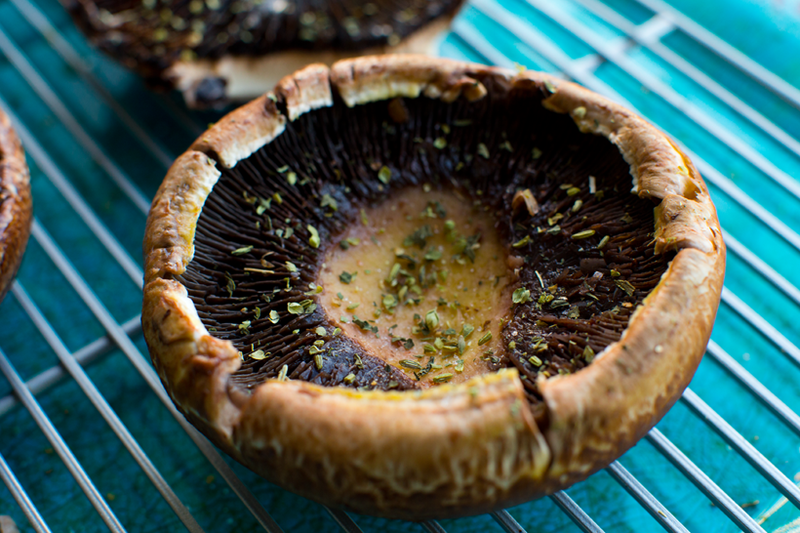 Drizzle 1/2 - 1 tsp extra virgin olive oil on each mushroom, then brush it all around with a pastry or grilling brush. 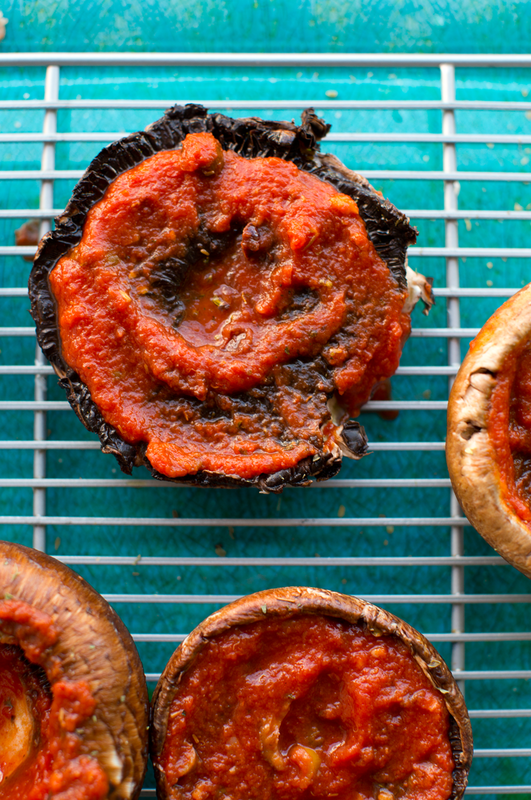 Sprinkle salt on each mushroom, just a pinch. Add optional pizza herbs or spices like oregano. I used Penzey's Frozen Pizza blend. 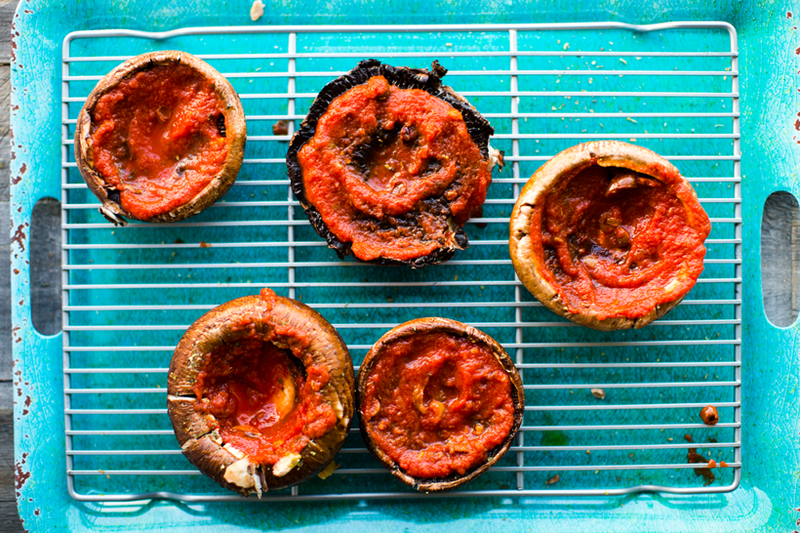 Add tomato sauce to each mushroom. 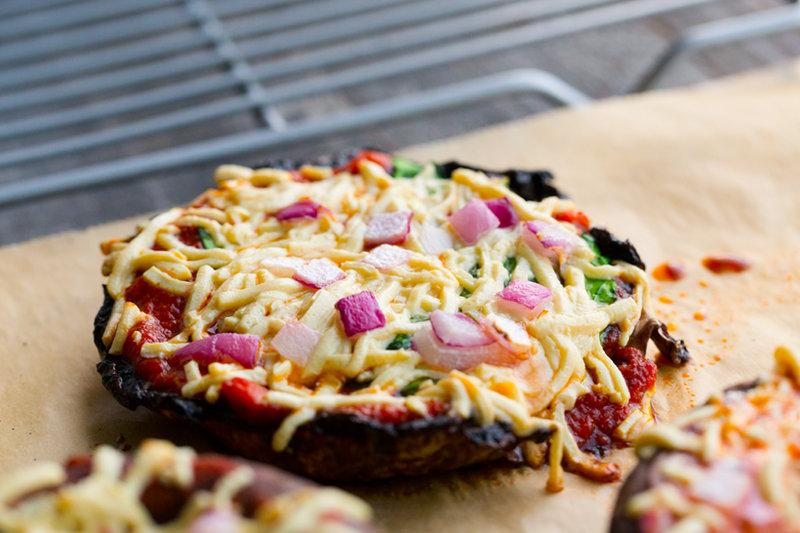 Then top with vegan cheese shreds and any additional veggies or toppings you want. 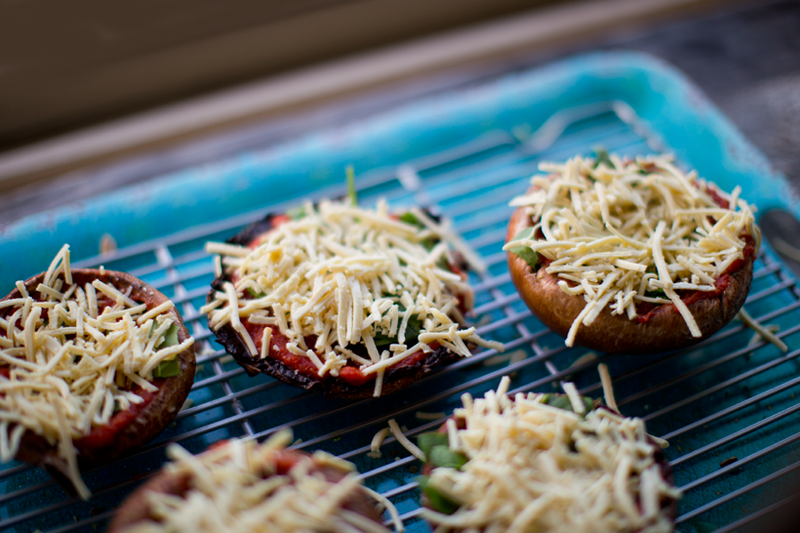 Bake for 15 minutes at 450 degrees - or until the cheese is super melty and mushroom edges start to curl up. Slice and serve! You can store leftovers in the fridge for up to one day. I did not test this, but I am guessing that these freeze very well!